Rio Mesa BSU leaders prepping for Black History Month in Feb, and just hanging out on a calm cool day in Sparta! Spartans Elevate-Together We Rise! WE>me! RM Senior IB English students are doing their individual oral exams (IOC) this week. So proud of all their hard work! 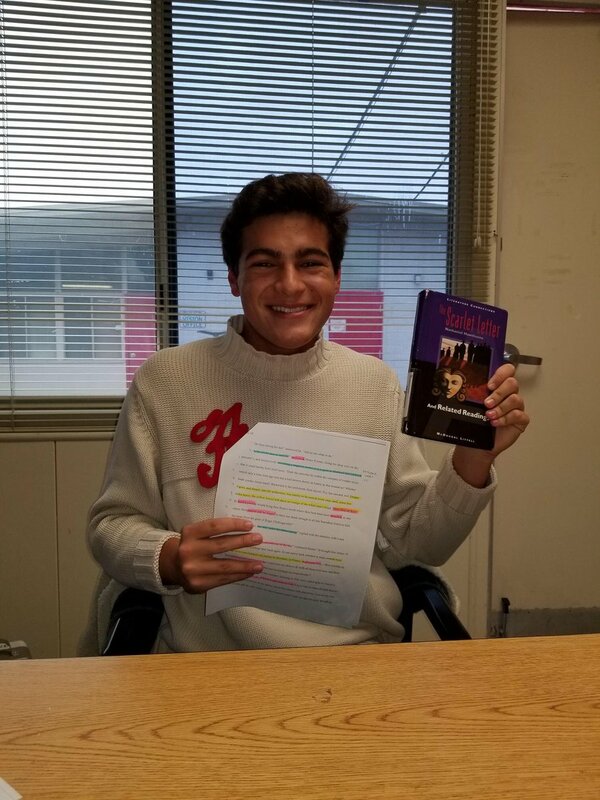 Michael Cardenas upped his preparation game by making his own scarlet letter! Spartans Elevate-Together We Rise! WE>me! Proud of 21 dedicated RM 11th graders– gave up 4hrs 2 prep for SAT test for college (coming back next Sat to review scores & practice more). 20 hours on Khan Academy is associated w/a 115 pt average score increase. These students will have a total of 8 hours of practice in 2 wks. 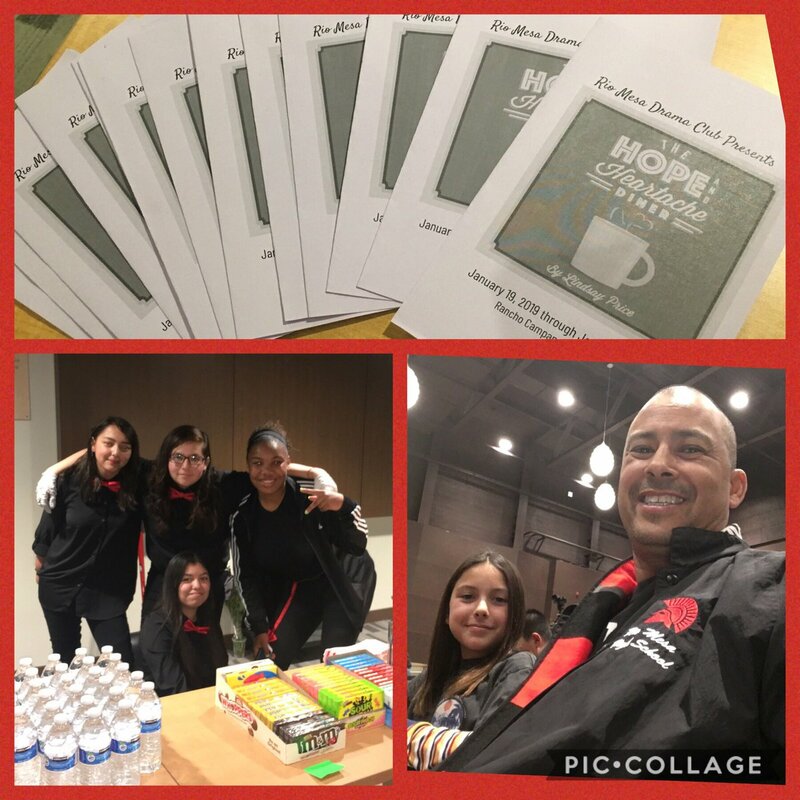 Ready to check out The Rio Mesa Drama Club presentation of The Hope and Heartache Diner by Lindsay Price! Spartans Elevate-Together We Rise! WE>me! 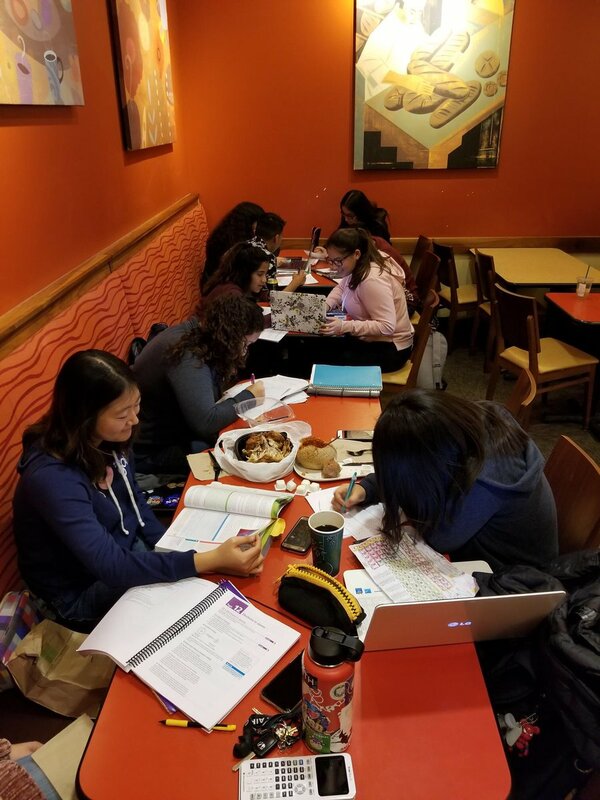 Some RM Seniors taking over Panera and getting prepared to ace their second day of finals. Spartans Elevate- Together We Rise! WE>me! 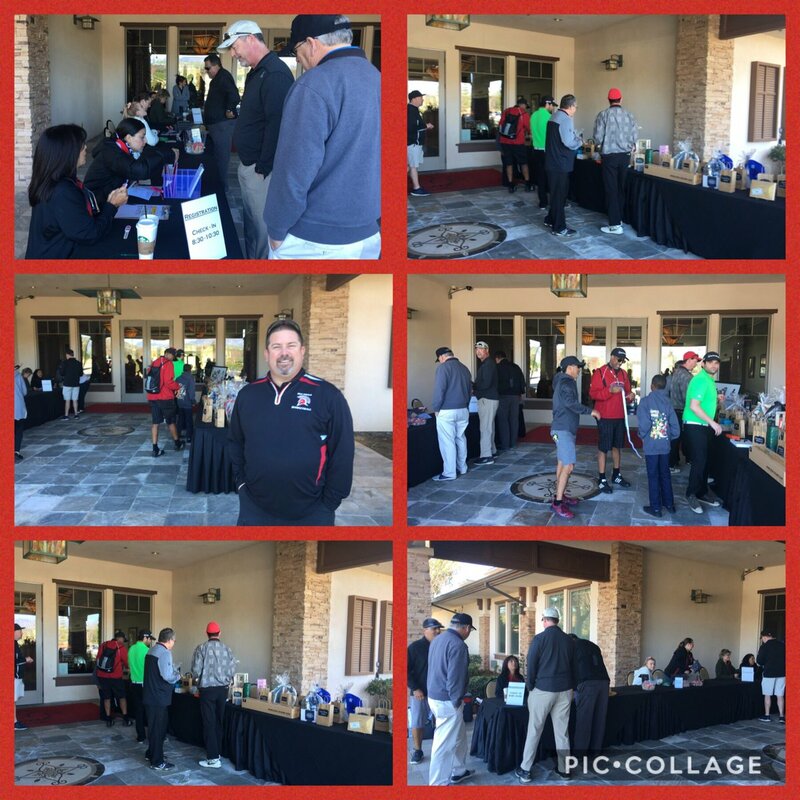 RM Athletic Booster Club Annual Golf Tourney under way on this beautiful Monday (MLK,Jr. 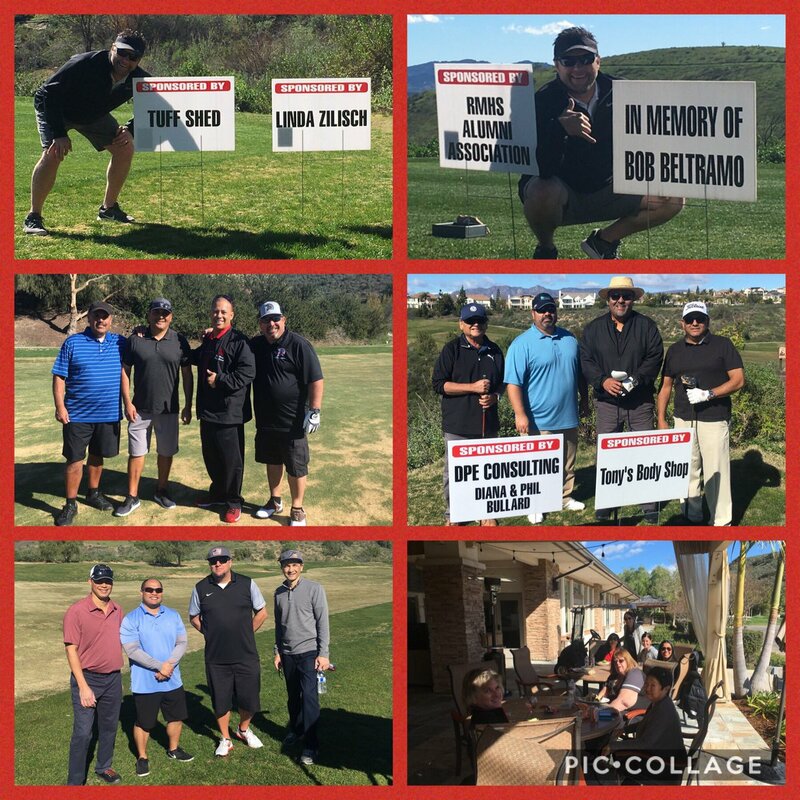 Day)!So thankful to all those who sponsored holes, donated prizes, set-up & participated in this event in support of the youth of the RMHS community! Spartans Elevate-Together We Rise! WE>me! We have an official update from the American Red Cross for the blood donation we did on November 2nd, of the 37 units collected, our students and staff were able to help save the health and lives of 111 patients in our local hospitals! That is great to hear! 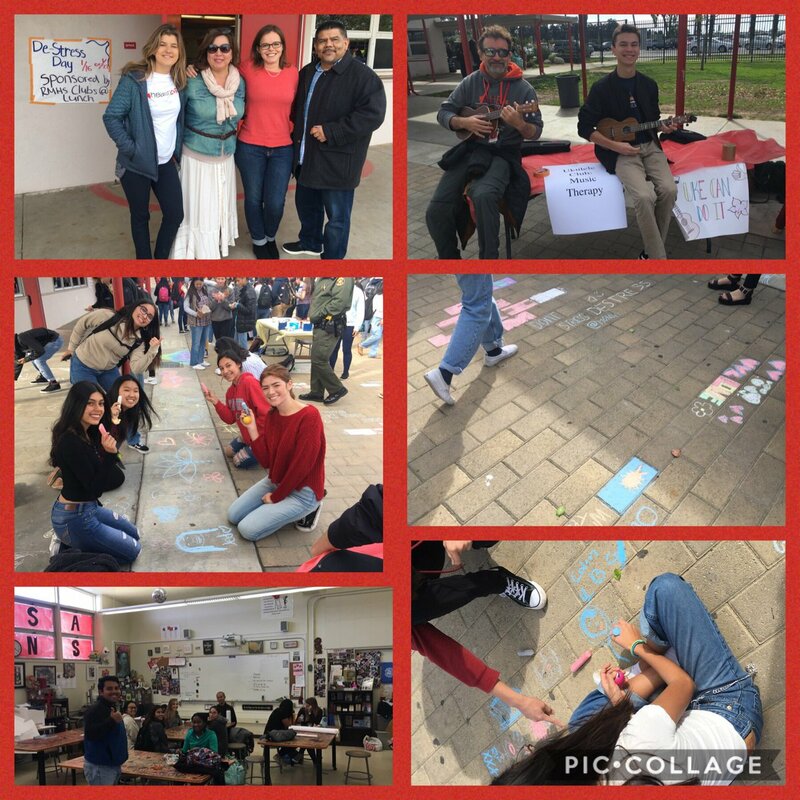 RM Teachers, Sandra Tchiprout & Laurena Guizar, helped bring a “De-Stress Express Day” in coordination with District Wellness Director, Jessica Sylon, before final exams begin! Spartans Elevate-Together We Rise! WE>me! During RMHS’s 1st Annual De-Stress Lunch Fair, Counselors passed out stress balls and played catch with students. Good luck on your finals! OUHSD, in conjunction with the Oxnard Police Department, is now accepting applications for their SPRING Community Law Enforcement Academy. If you are interested in a career in law enforcement, emergency services, security, or forensic science, this is a perfect opportunity for you! This opportunity is only available for 5 seniors. You must be on track for graduation, have at least a 2.0 GPA, and have excellent attendance. 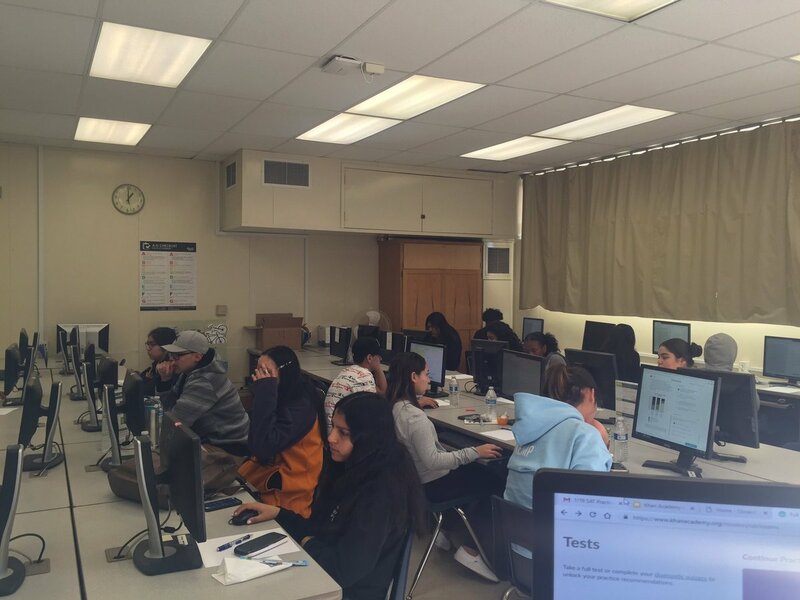 Classes will be held at Pacifica High School on Tuesdays and Thursdays from 4pm-6pm, for 12 weeks, including some Saturdays and students will earn 5 credits. Students are required to provide their own transportation. Students are selected through an application process and only 5 spots are available. If you are interested in applying, please see Mrs. McDevitt in the counseling office or see Ms. Magana in the College and Career Center for an application. Applications are due to Mrs. McDevitt by FRIDAY, FEBRUARY 8, 2019. Our next ELAC and Migrant Education meeting was Thursday, January 24th, at 6:30pm in the RMHS Cafeteria. Guest speakers, Zuleth Lucero and Lizbeth Molina from United Field Workers (UFW) of Oxnard, came to present their free support and services in our community. Cuba Montero reviewed the Language Census (R-30), the upcoming ELPAC Exam and the ELL programs and services at RMHS. The next meeting will be Thurs, February 21st, at 6:30pm in the RMHS Cafeteria. 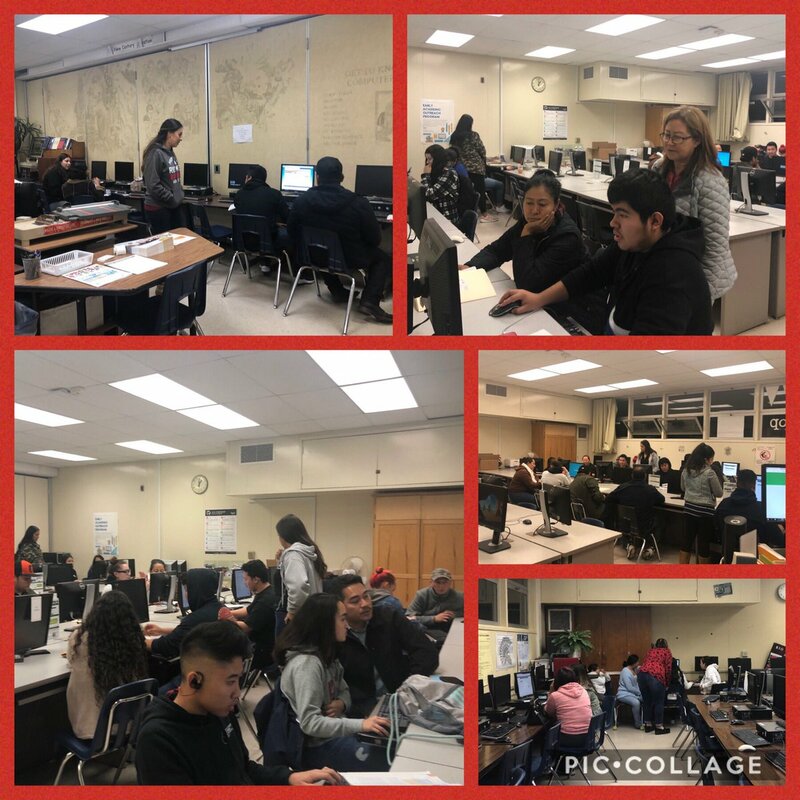 RM’s UCSB/EAOP Counselor with Counselors from Ventura College & RM Counselors- helping students and parents complete their financial aid applications for college at one of many Financial Aid workshops offered at RMHS! Spartans Elevate-Together We Rise! WE>me! So proud of RM JV Wresting Team! 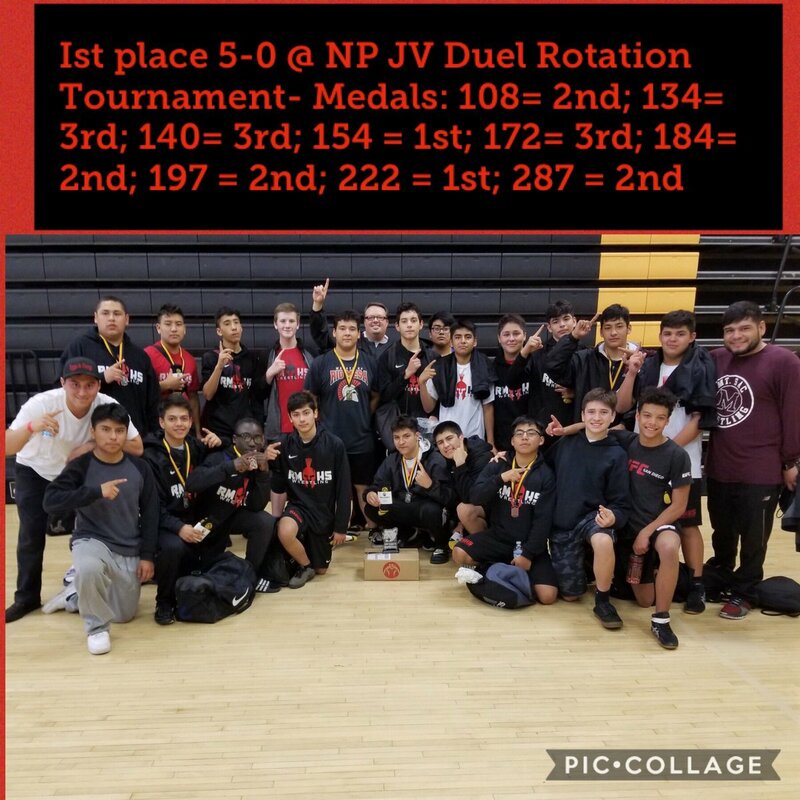 They took Ist place (went 5-0 @ NP JV Duel Rotational Tournament. Medals: 108= 2nd; 134= 3rd; 140= 3rd; 154 = 1st; 172= 3rd; 184= 2nd; 197= 2nd; 222 = 1st; 287 = 2nd! Spartans Elevate- Simul Autem Resurgemus! WE>me! 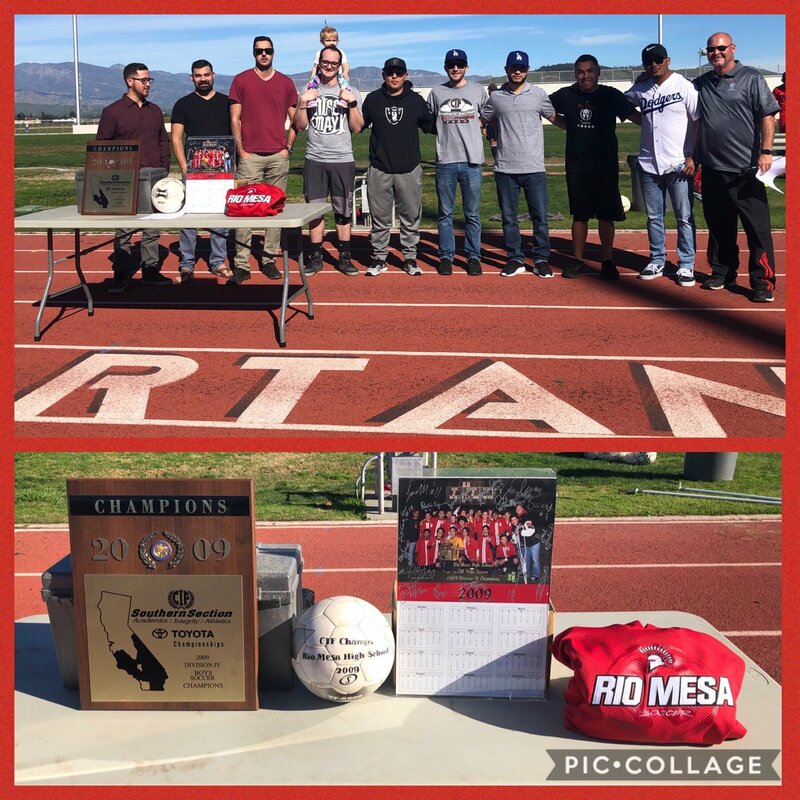 RM Boys Soccer celebrating the 10 year reunion of the 2009 Boys Soccer CIF championship. Always great to have alumni visit! Spartans Elevate-Together We Rise! WE>me! 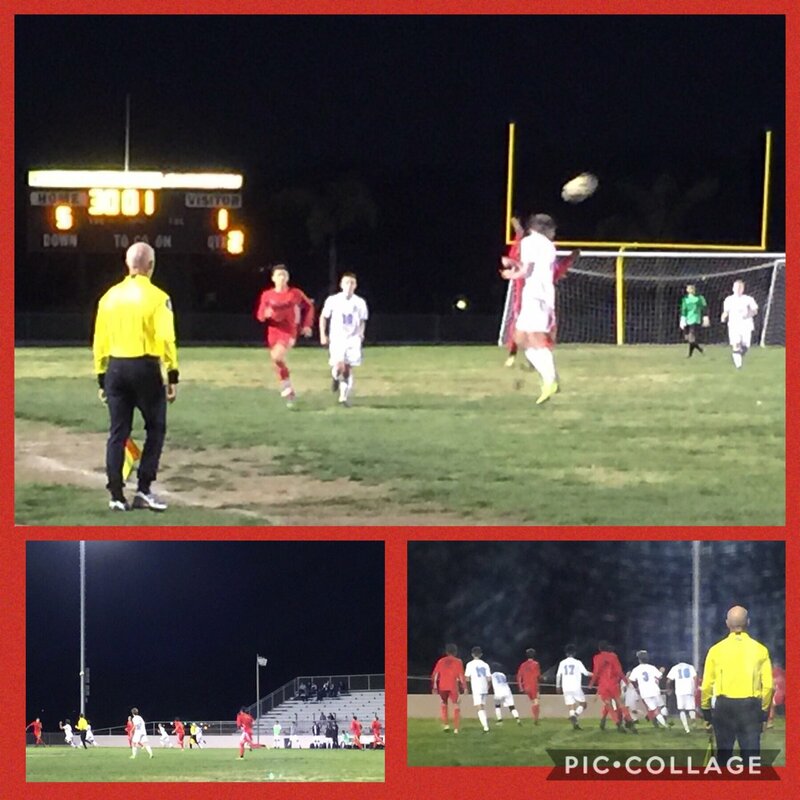 Congrats RM Boys Soccer on their 5-1 win over Buena HS! Our JV boys played to a 0-0 tie. Spartans Elevate-Together We Rise! WE>me! 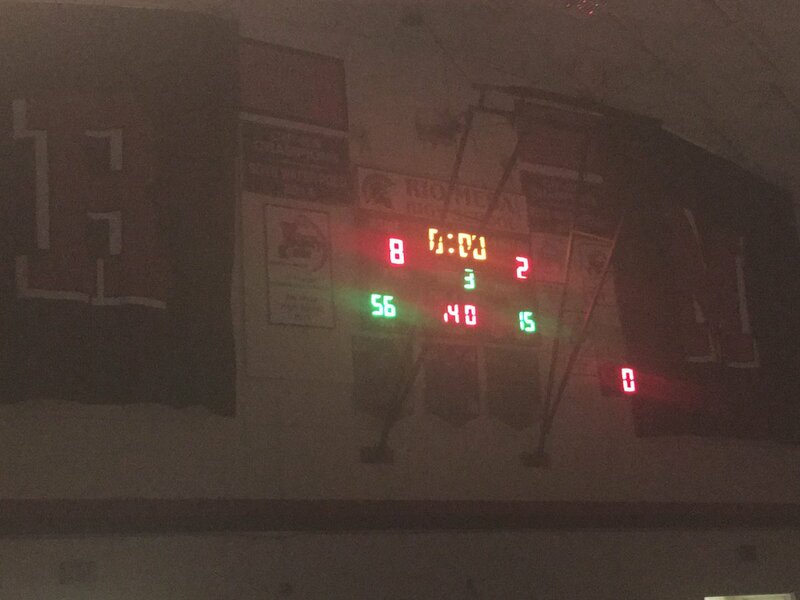 Congrats RM Wrestling on their team wins over CI tonight- JV won 57-18 – Varsity won 56-15 RM Varsity moved to a record of 4-1 in league. Varsity pins: 162 Manzo. Spartans Elevate-Together We Rise! WE>me!